A high-quality replica of the Nemesis Mod, solidly built and it’s gorgeous! The main tube on the Nemesis Mod features the famous Nemesis logo laser etched engraving on the mod’s stainless steel body. And like any exclusive mod, each one of the Nemesis mods has an individual serial number laser etched engraved on the body tube as well. The Nemesis Mod comes with 3 battery tubes sections to easily change the length of your mod and use different batteries sizes without having to purchase anything additional or worry about trying to find tubes that will match your Nemesis mod. 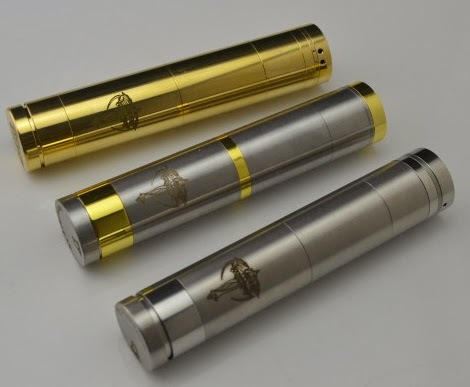 The mod tubes give you the ability to use of all three batteries; 18350, 18500, and 18650. The Nemesis Mod has a bottom button with an ADJUSTABLE POST! This makes this Remarkable Mechanical Mod not only extremely versatile, but in a class of it’s own. Installed are two N35 17mm disc magnets, which replace the springs in the switch. You get the original springs also.